The jobless rate for black men ages 16 to 19 is 45 percent. The Washington Post chronicles the job hunt of one black male teen, Kenneth Roberson of Memphis. The recent Booker T. Washington High school graduate was a top-ranked student at his school, which was described by President Barrack Obama as one of the nation’s most inspiring. 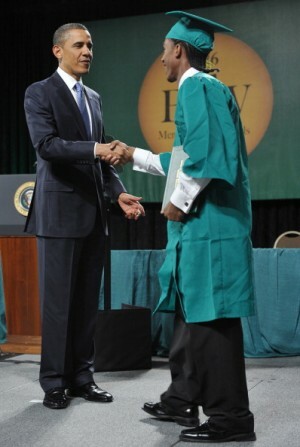 President Obama greets Christopher Dean during Booker T. Washington High School's May 2011 graduation ceremony. Obama called the school one of the country's most inspiring. Roberson and his peers face an uphill battle in trying to find jobs to help pay for school. But what if he was a little older and already had his college degree — would finding a job be more difficult for him than for a white college graduate? Even among those who’ve made the right choices—be it finishing high school or loading up debt to get a college degree—jobless rates are shocking. And the longstanding racial disparity among college graduates has grown markedly worse in the course of the downturn. In D.C. as a whole, the unemployment rate was 9.6 percent in April, according to the U.S. Department of Labor. But in predominately black Wards 7 and 8, it’s as high as 20 percent. And teens looking for work may be out of luck this summer, as the city’s summer jobs program faces funding cuts and will be accepting 8,000 fewer youth than last year. Who Can Claim 'Native Washingtonian' Status? ← Housing Prices Drop in Major U.S. Cities, Except in D.C. I wrote a paper about this exact subject when I was in undergrad. Basically, the gap in employment and wage-earning potential between blacks and other racial demographics increases the further you go in education, unless you get a professional degree (lawyer, doctor, etc). There’s always a need for lower-level wage jobs, which usually require just a high school diploma. More advanced fields are always in demand, so someone could always get a job in their own communities. For everyone else in the middle, the gap is very pronounced.